The defeat of the German army at Stalingrad in the beginning of 1943 was the turning point of the war in Europe. After Stalingrad, the Red Army had the initiative, and the Wehrmacht was in retreat. The Russians felt that the west was not contributing enough. 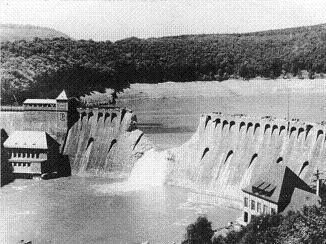 The RAF attacked three German dams in May of 1943. 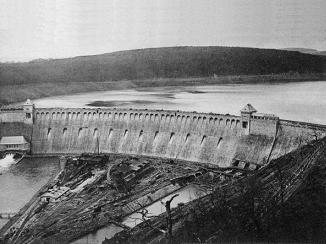 Although the impact of the attack on the German war production was minimal (one of the two key dams did not breach), the pictures of two broken dams proved to be a propaganda and morale boost to the British, and perhaps the Soviet Union was given a sop in place of a Second Front in 1943. 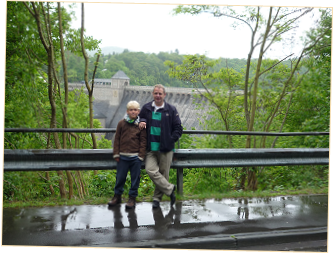 This write-up covers visits to the dams. 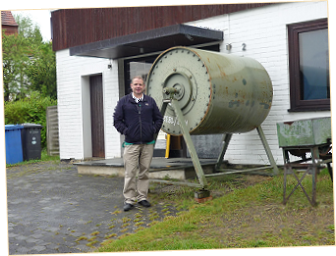 It also includes a visit to the historic Henrichenburg boat lift in the Dortmund-Ems canal, and some words about cold war highway strips. The Dortmund–Ems Canal is a 269 km long canal in Germany between the inland port of the city of Dortmund and the sea port of Emden. 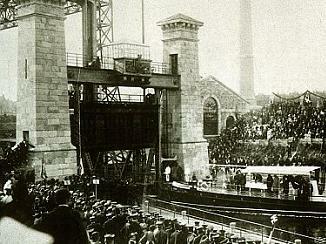 The canal was opened in 1899. 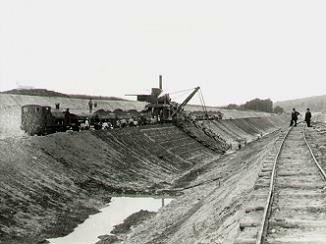 The reason for the construction of the canal was to lighten the load on the railways, which could not transport the products of the Ruhr area. 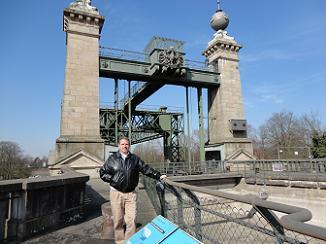 The best known building of the Dortmund-Ems canal is the Henrichenburg boat lift in Waltrop, which enabled a ship to bridge a difference in height of 14 metres. 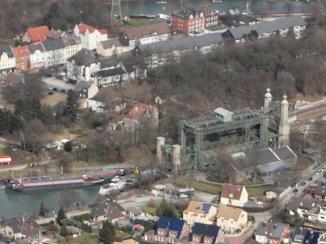 It was an important structure on the Dortmund-Ems-Kanal without which it would not have been possible to navigate to Dortmund Port. 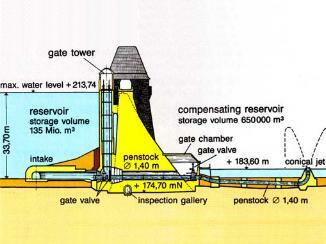 It could accommodate vessels of up to 350 tonnes. The old lift was closed shortly after the opening of the new lift in 1962. 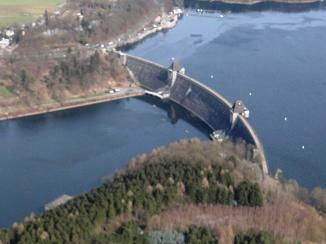 The Sorpe dam (Sorpetalsperre) is an earthfill dam with a concrete core, and was constructed between 1926 and 1935. 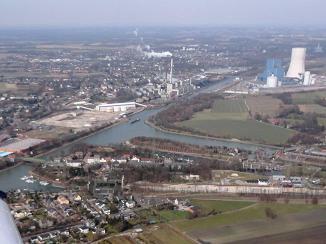 The Sorpe reservoir (Sorpesee) contributes to the Ruhr river downstream. 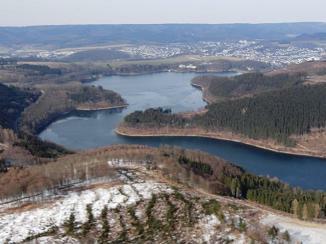 the Sorpe's reservoir is one of the major artificial lakes of the Sauerland's Ruhrverband reservoir association. Besides serving as a water supply, it is utilized for electricity generation and as a leisure and recreation area. 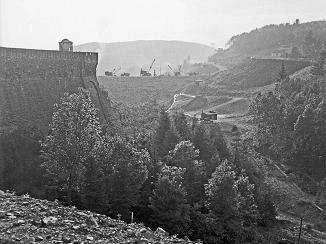 The Sorpe dam was the target of several air raids during World War II. 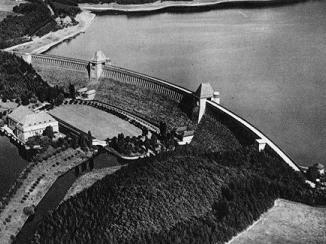 Even though the dam was hit by 11 bombs, it did not collapse. There was damage of the concrete core caused by the bombs. 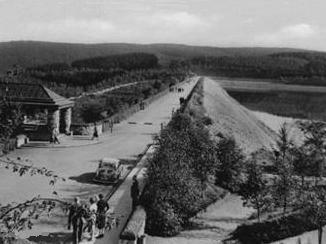 Between 1958 and 1962 an extensive rehabilitation project was implemented. 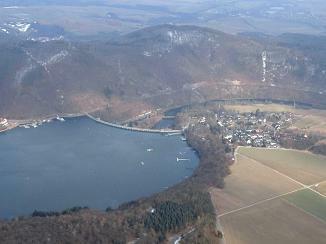 The Möhne reservoir (Möhnesee) is an artificial lake formed by the damming of two rivers, Möhne and Heve, and with its four basins stores as much as 135 million cubic metres of water. 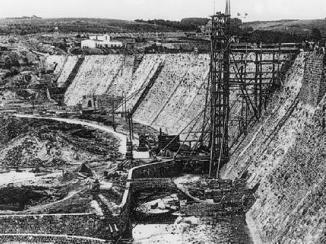 The Möhne dam (Möhnetalsperre) was built between 1908 and 1913 to help control floods, regulate water levels on the Ruhr river downstream, and generate hydropower. 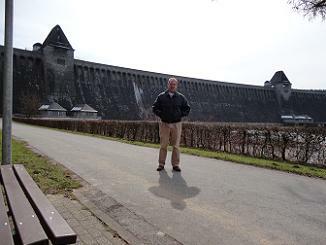 During World War II in the early morning hours of May 17, 1943, the Möhne dam was severely damaged by a bomb attack. 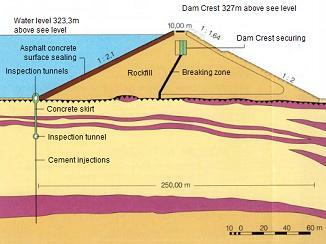 The dam was destroyed to a height of 23 m and over a length of 77m. The following flood wave killed more than 1,500 people. 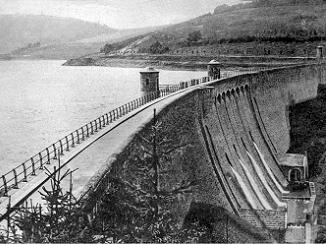 The breach in the dam was closed the same year, and the reservoir could soon be used again to provide water for the Ruhr area. Since 1992 the 80 year old bottom outlets inside the gate towers have been replaced and the gate towers have been sealed. 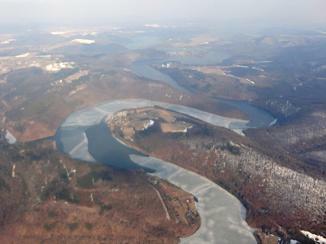 The reservoirs are surrounded by forests which protect the stored water. These forests are being ecologically cultivated by the Ruhr River Association. Today, the lake is also a tourist attraction. 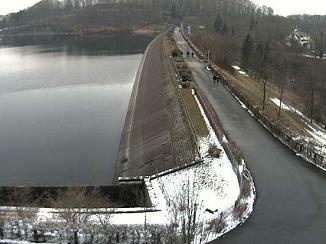 The Henne reservoir (Hennesee) is an artificial lake formed by the damming of the Henne above Meschede. 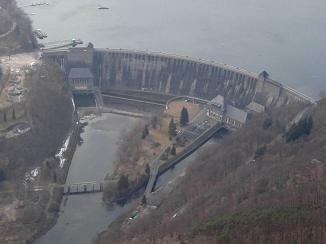 The current dam (Hennetalsperre) was built from 1952 to 1955 as a replacement for an older one that was built between 1901 and 1905. 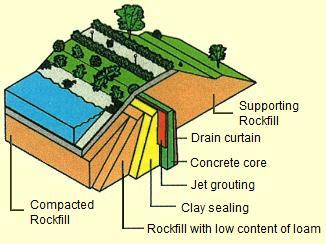 Water was finding its way through the earth layers below the rocky soil upon which the old dam was built. 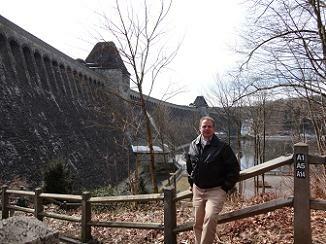 The old dam was decommissioned for safety reasons in 1949. The Henne Reservoir serves to ensure water supply, flood protection and hydropower generation and is used for recreational purposes. 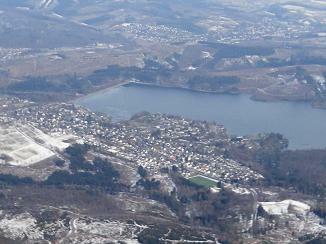 The Meschede, Schüren airport is near the Henne reservoir. The Eder dam (Edertalsperre; Eder sperrmauer) was built within the years 1908 to 1914 to guarantee a sufficiently high water-level for the navigation on the Weser and in the Mittellandkanal also in the summer months. Furthermore a power station served for the electricity generation. 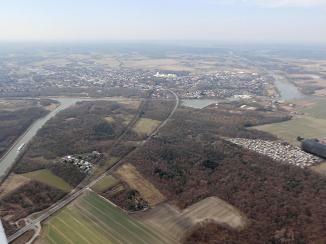 At low water, in late summers of dry years, the remnants of three villages (Asel, Bringhausen, and Berich), along with a bridge across the original river bed, that were submerged when the Edersee was filled in 1914, can be seen. 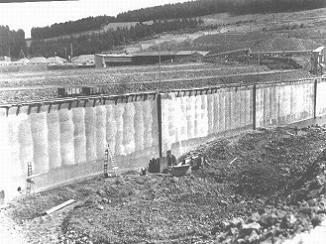 During World War II in the early morning of May 17, 1943, the Eder dam was severely damaged by a bomb attack. 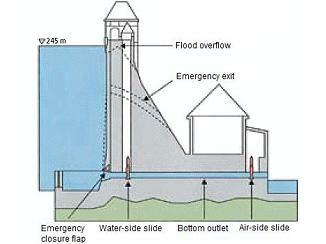 68 people died as a result of a flood wave. 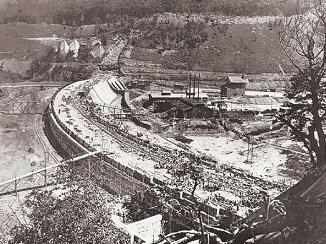 The dam was repaired within months. Today the lake is a major summertime recreational facility. 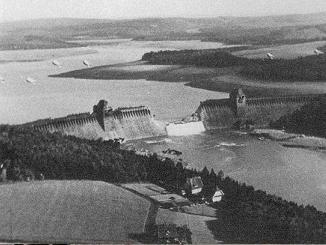 Operation Chastise was an attack on the Möhne, Eder and Sorpe Dams carried out on 16–17 May 1943 by Royal Air Force 617 Squadron, subsequently known as the "Dambusters", using a specially developed "bouncing bomb". 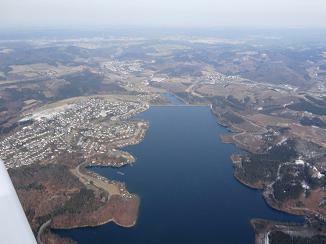 The Möhne and Edersee Dams were breached, while the Sorpe dam sustained only minor damage. 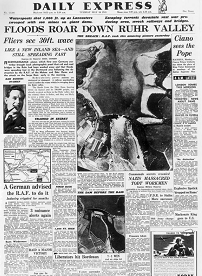 Outside Britain, the Dambusters raid is not well known in Europe. In Britain the attack was credited with disrupting water and electricity supplies for the manufacture of war munitions, and the raid was a significant boost to British morale. However, the disruption to the German war production was minimal. 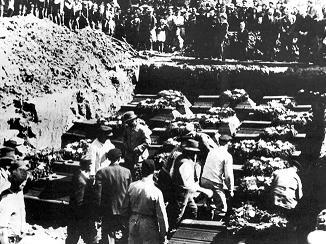 More than 1,500 people were killed along the Möhne and Ruhr rivers, and 68 in the Eder Valley. Two-thirds of the victims were foreign prisoners of war and forced-labourers, the majority women, in different camps, mainly from the Soviet Union. Only eleven of the nineteen Lancasters made it safely back to RAF Scampton. Of the 133 men who took part in the raid, 53 lost their lives and 3 were captured having bailed out. In 1977, the Geneva Conventions outlawed attacks on dams "if such attack may cause the release of dangerous forces from the works or installations and consequent severe losses among the civilian population". After visiting the Henrichenburg boat lift and the Möhne dam on the way to Paderborn-Lippstadt airport, I arrived at the airport at 1pm. 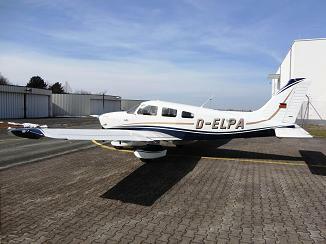 I was asked to fly the D-ELPA, which had recently received a new engine and had flown only twice since. For the new engine to settle, it had to be fueled with expensive AVGAS. Normally the planes are fueled with Euro 98 gasoline. After take-off runway 06, I turned left to reporting point November. I followed the Lippe, and later the Datteln-Hamm canal to Datteln, where four canals cross (Dortmund-Ems canal, Wesel-Datteln canal, Rhine-Herne canal and the Datteln-Hamm canal). After sight-seeing the Henrichtenburg boat lift, I requested and received permission to cross the Dortmund CTR in the direction of the Sorpesee. 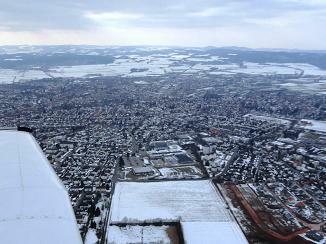 Next I flew to the Möhnesee, and then to Meschede-Schüren airport where I landed on runway 04. 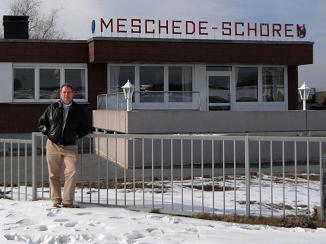 At Meschede airport I called the Korbach airfield operator on his mobile. 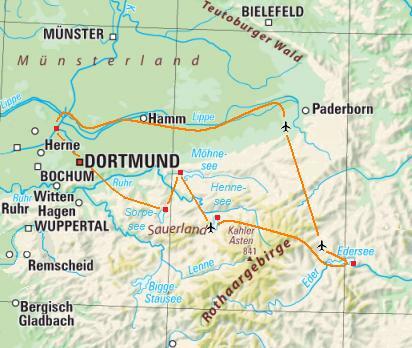 There was no response, and I made the plan to fly to the Edersee, and then back to Paderborn-Lippstadt airport. 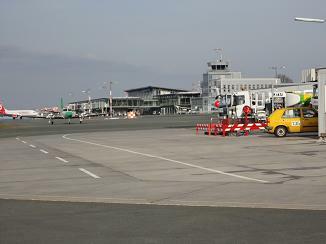 I had a coffee at Meschede airport, and then returned to the plane. 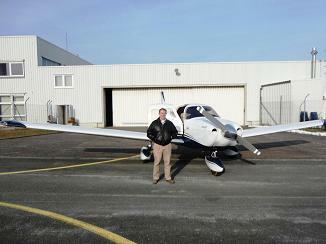 Just before I was going to start the engine, I was called by the Korbach airfield operator. 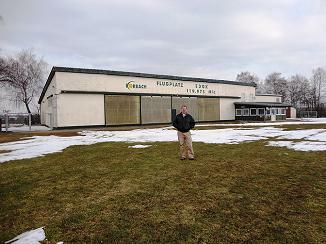 He told me I could land at Korbach airfield, and he would go there to receive me. I started the engine, and departed from runway 04. 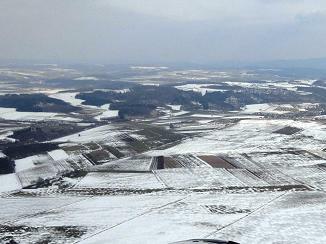 At Edersee, I orbited the Eder dam, and then flew to Korbach airfield where I landed on runway 03, which was partially in snow. May 10, 2014 was a rainy day. 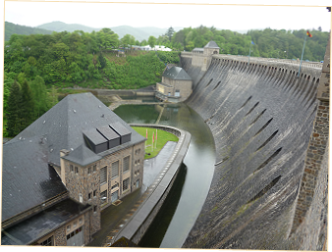 We were on a weekend trip to the Sauerland, and Roberto, Rover and René decided to make a visit to the Eder dam and the small museum at Edersee. After parking the car on the north-east side of the dam, we walked over the dam to the town of Edersee, where we also had something to drink. 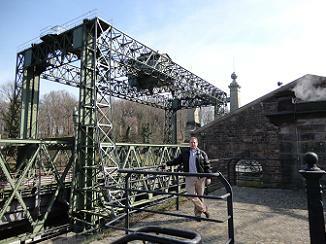 Then we paid a visit to the Sperrmauer-Museum Edersee. The museum has a full-size replica Upkeep, as well as a model of the dam after the raid. It also displays information about the bombing of German cities, especially in the nearby city of Kassel. The museum was founded in 2000 and is run by a non-profit association. 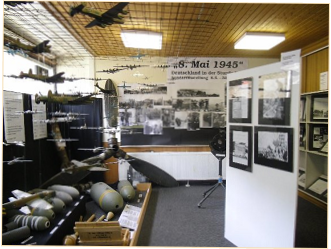 The museum covers the attack on the dams, background, results, victims, pilots, the aerial war and more. After a few minutes the operator arrived. We had a chat, and after I payed the landing fee, with some extra for the operator for his efforts to drive to the airfield, I took-off to return to Paderborn-Lippstadt airport. 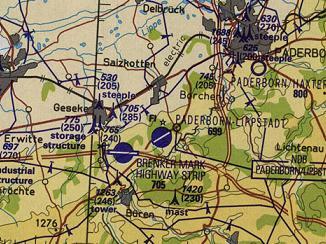 On an old military tactical pilotage chart, a highway strip is depicted just south-west of Paderborn-Lippstadt airport on the Autobahn A44. A highway strip is a section of a highway or motorway that is specially built to allow landing of (mostly) military aircraft and to serve as a military airbase. These were built to allow military aircraft to operate even if their airbases, the most vulnerable targets in any war, are destroyed. 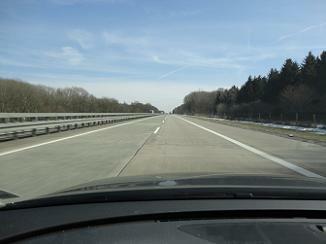 In the Cold War highway strips were systematically built on both sides of the Iron Curtain, mostly in the two Germanys. 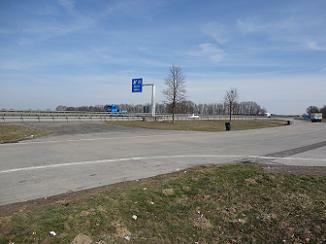 The highway strips could be converted from motorways to airbases typically within 24 to 48 hours. Central reservation was made of crash barriers that could be removed quickly in order to allow airplanes to use the whole width of the road. 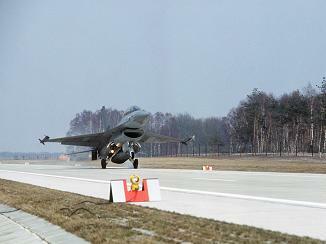 The A44 Brenker Mark Highway Strip could serve as a makeshift landing strip for US Air Force military transports, that could fly direct from the United States in case of conflict with the Warsaw Pact. There were removable guardrails, and at both ends of the section there are parking lots that could be used for unloading and turning the aircraft.